"Why We Buy" is a witty and surprising report on our evolving shopping culture. This is a book about us, from moms and dads to seniors and mall rats, and what we do, and don't do, in stores, restaurants and showrooms. "Why We Buy" is about the struggle among merchants, marketers and increasingly knowledgeable customers for control. With humor, insight, anecdote and lots of hard data, retail anthropologist Paco Underhill leads the reader through a journey into shopping heaven and hell. For those in retailing and marketing, "Why We Buy" is a remarkably fresh guide, offering concrete and usable advice on how to adapt to the changing customer. For the general public, "Why We Buy" is a charming, funny and sometimes disconcerting mirror of who we really are. Underhill and his company, Envirosell, are credited as being the founders of the science of shopping. For almost two decades, Underhill has been leading blue-chip clients into the retail trenches. Like a modern-day Margaret Mead observing at the local mail, Underhill's firm records and measures with great precision what goes on in stores as we wander or rush about, find what we want and sometimes do the unexpected. From base camps in New York City, Milan and Sydney, Underhill and his colleagues follow in person and on videotape between fifty thousand and seventy thousand shoppers a year through their retail experiences in stores, banks and public offices. (They record some twenty thousand hours of what Underhill reports to be generally some of the most profoundly dull videotape imaginable.) "Why We Buy" explains how consumer and retail marketing has gone from being a war to being a bar fight, an environment in which Coke iscompeting not only with Pepsi, but with every other product on promotional display. The marketing tools the retail and package-goods industries have built over the past century no longer work as well as they used to. The gender models that have driven stores and designers have become increasingly obsolete; there is a reason why the Jeep Cherokee comes with a makeup mirror on the driver's side. With wry humor, "Why We Buy" looks at men trying to buy gifts in lingerie stores and women struggling for attention, service and respect in car dealerships and technology stores. It reveals how men are more promiscuous buyers and softer touches for children, as well as how a woman will spend even longer in the aisles if she is with a woman friend. In "Why We Buy," Underhill explains why we do what we do, notice what we notice, ignore what we ignore and buy what we buy. He tells us, for instance, why women won't linger to shop in narrow aisles, why the Internet cannot replace the shopping mail, how hardware stores are learning to adapt to women and how men are beginning to shop like women, how working women have altered the way supermarkets are laid out and why the person in charge at a branch bank sits at the desk farthest from the front door. 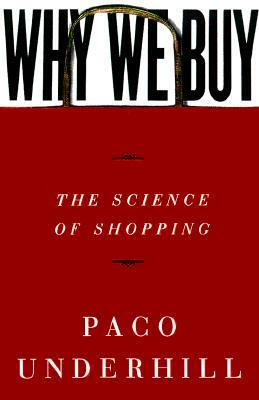 Paco Underhill's "Why We Buy" amuses and instructs, and it will change forever the way you look at stores and at yourself.